Many CCC Camps in the east are located in old ghost towns. However, before I begin to explain what the camps were and where they could be located, I’ll explain some history regarding the old camps. It would be unfair not to mention the many men who worked so hard to reforest the hundreds of thousands of acres of land in the United States from 1933 until 1942. They worked hard, and lived away from home. For many of these young men, it was the only work they could find. They were rugged individuals who worked in all kinds of weather conditions. They worked, ate, and slept in camps where they were working. It is because of their hard work as Civilian Conservation Corpsmen that today we have many beautiful forests. And hidden away on some of these forested areas, or State lands, are not only the CCC camps, but lost settlements…ghost towns. 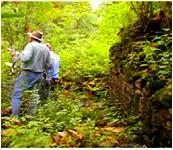 If you live in the Southern, Midwestern or Eastern States, and you would like to explore the adventure of searching for a CCC camp, or an old ghost town, then begin your journey on the State Lands. The CCC’s reforested State lands in the early 1930’s. The depression years took it’s toll on many. Hard working individuals struggled to get by. Many property owners lost their land because they were unable to pay their property taxes. 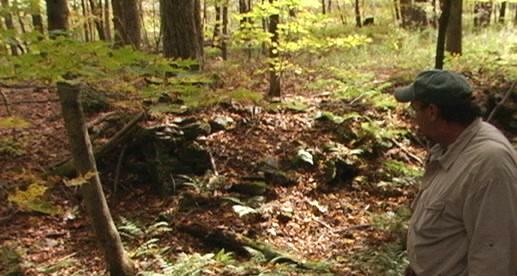 It was on these lands where CCC’s forested, and built their camps. Many years before the CCC’s built their camps and reforested those areas, old towns had existed. They were once active communities. Now they are ghost towns, much like the old towns of the west. The difference is the ghost towns in the east are no longer visible. Today they are nothing more than a hole in the ground, a cellar hole. Frank W. Pandozzi is a participant in the Amazon Services LLC Associates Program, Clickbank, and MyTopo affiliate advertising programs designed to provide a means for sites to earn advertising fees by advertising and linking to amazon.com, mytopo.com, and clickbank.com. Please visit my Affiliate Disclosure below for more information. You can locate where the CCC camps once stood, and the ghost towns. By the time the young men of the CCC’s came onto these small, forgotten hamlets, during the 1930’s, the only reminders to them, that a home, a school or a church once stood there, were the empty cellar holes. In the few short years after the stock market crash, the United States was still reeling from its effects. The economy was sick and unemployment was high. In addition, our declining timber resources, and the erosion of soil in many States made it clear to then President Roosevelt that something needed to be done. As a part of his New Deal program, President Roosevelt pushed for a Civilian Conservation Corps made up of young unemployed men to fix the problems of unemployment and the decline of our natural resources. In 1933 President Roosevelt’s CCC idea passed congress and the program was immediately put into effect. Young, unemployed men, the average ages of eighteen to 20 years of age, jumped at the chance to work, and voluntarily enrolled into the CCC’s. The Army because of their experience with discipline, and their organization of so many young men, took control of the Civilian Conservation Corps. CCC camps were built in every State to house the men. For many of them, this would be their first time away from home. The camps consisted of a bunkhouse, a mess hall, and a building consisting of a recreation room, and a PX where the men could purchase toiletries and food. 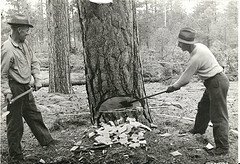 Many of these ccc camps exist today on State lands. The young men worked six days a week. They rested on Sundays. Their wages amounted to thirty dollars a month, with twenty-five dollars of that going to their families. In charge of each camp was a commander. He was usually a Lieutenant or a Colonel in the Army. Discipline of the men was a much-needed requirement inside the camps, and acts of violence and or breaking of any of the camp laws was not tolerated. Punishment was handed out to unruly men much like it was in the military. KP duty (Kitchen Patrol) and confinement to the bunkhouse during times of recreation were some of the punishments handed out to the young men. In extreme cases of unruly individuals, the person was asked to pack up his goods and return home. The men had to thin the forest and plant trees. Over 3 billion trees were planted during the time the CCC’s were operational. In addition to reforestation the men of the CCC’s built 3400 fire towers, and made 97,000 miles of fire roads. They also fought floods and installed telephone poles. Their work and the economy had indeed become the strength of the country that President Roosevelt had imagined. However, by the time 1942 had arrived, congress felt that there were more pressing issues than spending money on the CCC program. World War all was costing the United States money. The problems with unemployment that had plagued the country when the CCC’s program was first initiated, was now on an upswing. Congress felt that the money they were spending on President Roosevelt New Deal program would be better spent on the war issue. In 1942 the CCC camps were emptied of men as quickly as they were filled, and the removal of the program was instituted. Many of the camps have been torn down. However, as mentioned earlier, some still exist on State lands. you can have a great adventure searching for the CCC camps and the ghost towns in the eastern and southern half of the US. Today there are CCC museums in many States. Some of the old CCC camps have been used for a museum. I have searched for many of the camps that have been torn down. I love the history of the old CCC camps, and the eastern ghost towns. And the search for one, can lead to another. 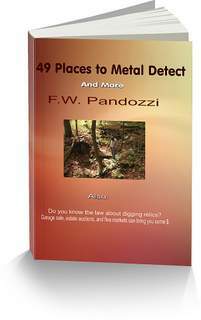 "Where To Find Treasure, Cash And Coins Using A Metal Detector"
I am an affiliate marketer. This means that certain products that you may see advertised on this site I get paid a small commission if that product is clicked on AND purchased by you. Those products, whether pictures of a service or a product contain links to the seller. What companies do I work with and promote? I work with Amazon Services LLC Associates Program, Clickbank, and MyTopo, affiliate advertising programs designed to provide a means for sites to earn advertising fees by advertising and linking to these websites. I also promote Solo Build It Site Built It, because it's the product I used to build this website. Please do not use this website if you disagree with any of the terms outlined here.